Dutch DJ and producer Sander van Doorn is presenting his Doorn Records label night, which will kick off with an event at ADE on October 16. Doorn Records has had a successful year so far, including ‘Tsunami’ from Dvbbz, and now Sander is looking to bring the platform to stages worldwide with a tour featuring artists from his label. For his Doorn label night on October 16, he has invited some of the finest and most talented artists that he has worked with for his label to come spin some records and show the fans what Doorn Records is all about. 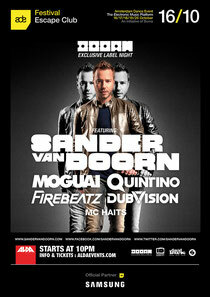 This includes Dubvision, Firebeatz, Moguai and Quintino, and of course Sander himself. Following this, Sander will announce world tour dates, which will feature new production including visuals and lighting, and will be focused on keeping costs low so that clubbeers can come and enjoy what Doorn Records has to offer. Sander: "I'm very proud of the great talents I got to work with as a label owner, I love it! I feel blessed that I can give young talent a platform to release their music and believe it is very important for the dance music scene. I help them build a great track and learn a lot from them at the same time. Now I feel it's time for a tour concept that shows the diversity of my sound and brings that energetic Doorn vibe to the stages!"